Yes you read that right LADs and LASSes, it’s a VEGAN fish pie. I’m so proud of this recipe, a 100% vegan recreation of a British classic. 1. A combination of regular and smoked tofu to give fish-like texture and smoky flavour. 2. Ground up Nori sheets to give the ‘fishy’ flavour. 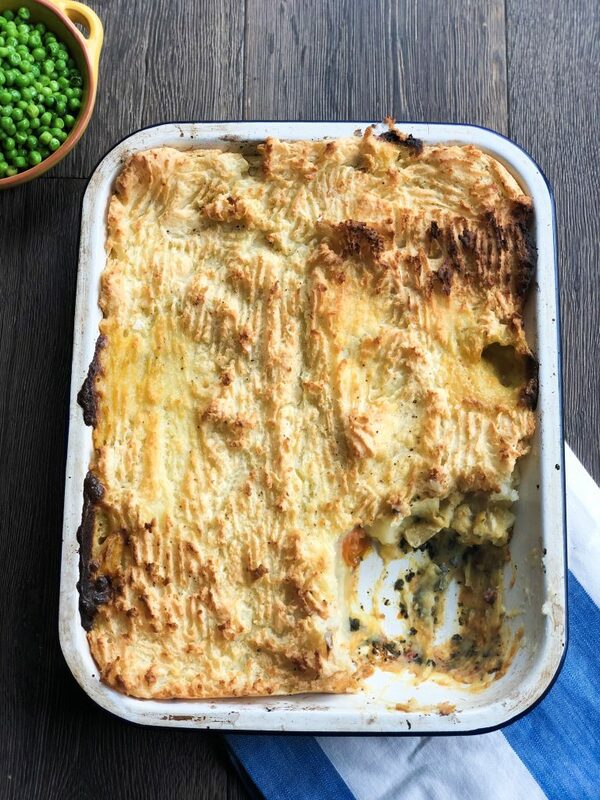 This vegan fish pie is so convincing that when I reheated it for lunch at work, my colleagues came in and were like: ‘Eurgh! Who’s having fish? !’ My work here is done people. A simple recipe too, the most time consuming bit is peeling all the potatoes! 2. Peel the potatoes and chop into 2cm wide chunks. Cook in boiling water until soft (about 10-15 minutes), prod them with a knife to check they’re ready, it should pass through easily. If you’re like me and like loads of mash and have a big tray, then use 2-2.5kg, but if you’re not as greedy, 1.5kg should be fine. 3. While they’re on, get a large baking tray and grate the carrot, celery, chilli and lemon zest into it (use a fine grater for the lemon zest). 4. Chop the tofu into chunks. I go for about the size of a fat chunky chip. You want it to hold together but not be so big it doesn’t incorporate with the other stuff in the pie. Add the chunks to the tray. 5. Use a blender to grind the Nori sheets into a flaky powder. Add this to the tray with 1 tablespoon Dijon mustard, 2 tbsps nutritional yeast, 150g grated vegan cheese and a sprinkling of chopped parsley and chives. 6. Squeeze over the juice of the zested lemon and a drizzle of olive oil. Add the tomatoes and season the pie filling with sea salt and black pepper. Mix everything together well. 7. When your potatoes are soft, drain and leave to steam dry for 1-2 minutes. Return to a pan and mash baby! Add a good couple of tablespoons of sunflower spread to smooth it out. Season well with sea salt and black pepper. Mash until smooth, don’t worry if there’s a few small lumps, it happens. 8. Spoon your mash on top of the pie mixture and smooth it out until the whole tray is covered. Fluff the mash with a fork, this gives you those epic crispy bits! Add a couple of dollops of sunflower spread on top (this also helps with crisping). 9. Cook in the over for 40-45 minutes until the top is crispy and golden brown. Serve on its own with a dollop of ketchup or with some minted peas. 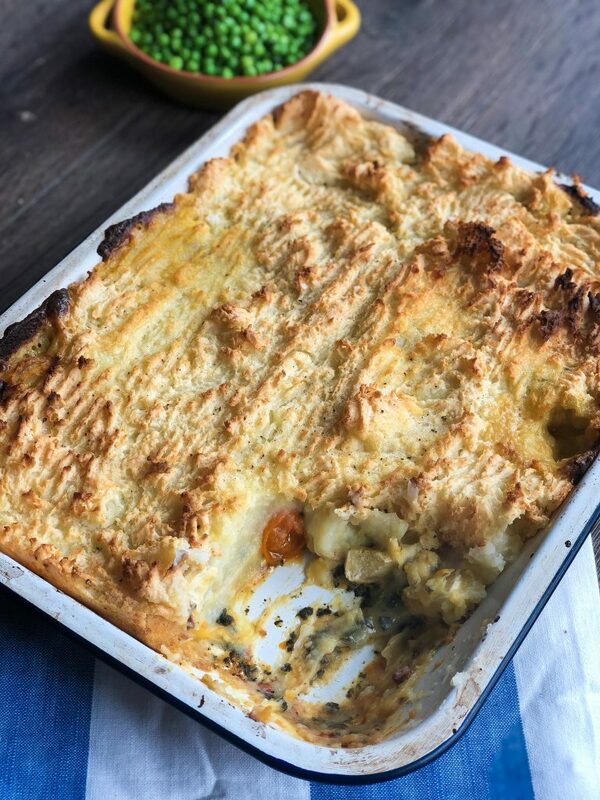 Sit back, relax and bask in vegan fish pie perfection! Very tasty and moreish, my fiancee was very impressed It was his first foray Into Tofish and he said he wouldn’t have changed a thing were his words.